Hitting the gym can be a bit of a hardship when traveling. You're out of your element, not able to use the equipment your familiar with or trying to figure out how to power up the elliptical facing the corner wall. Hotel and resort gyms often tout state-of-the-art equipment and a stellar setting, but that doesn't mean it makes it any easier to get up and hit the gym. This is especially the case when you are on vacation and the beautiful beach or magnificent mountains are outside waiting. 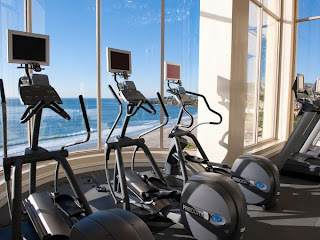 So it is no surprise that some fabulous resorts are providing not only a top-notch workout facility, but one with an amazing view. Burj Al Arab is world famous resort in the chic setting of Dubai. Known for it's glorious and unique sail shape architecture, this hotel offers guest everything that is spectacular, and why would the gym be any different. Located on the 18th floor, the Assawan Spa and Health Club is a true gem. Just like everything you see in Burj Al Arab, the fitness facility is cutting edge and offers guests the best available in fitness. But what will truly capture your attention upon arrival is the view. Nothing makes an hour long run seem less daunting then a spectacular view of the Arabian Gulf and its stunning coastline. Our next stop is in spectacular Dana Point, California. Ritz-Carlton Laguna Niguel is one of the world's most luxurious and elegant hotels. Located in southern California, the entire resort is highly rated and promises guests a stellar time. 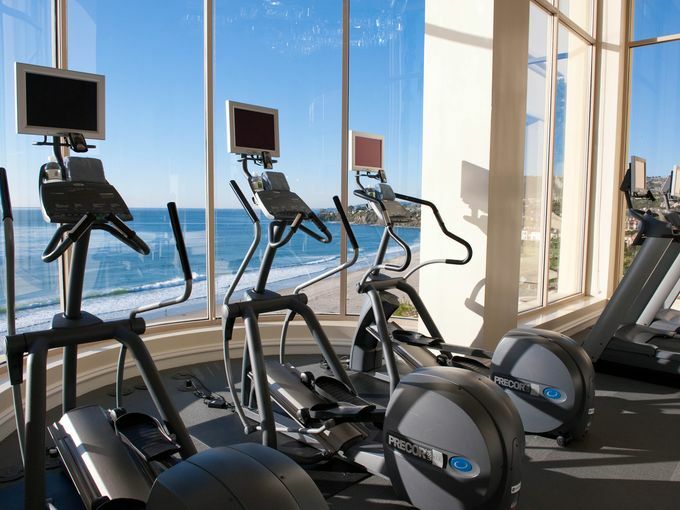 If during your stay you feel the need to hit the gym, Ritz-Carlton Laguna Niguel has the newest equipment to ensure you get in your best workout, but also a view that will guarantee to raise your heart rate. A trip to Italy promises exceptional views regardless of where you stay, but time at the Monastero Santa Rosa Hotel and Spa offers up a scene that will prove unforgettable. 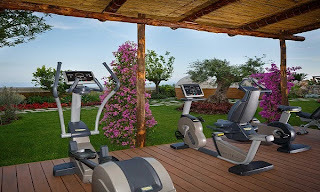 This fitness center is outside and located 980 feet up the face of a cliff overlooking the Gulf of Salerno. Monastero Santa Rosa is a secluded locale with a intimate feel and the fitness center is a beautiful extension of the resort. As long as you don't workout too close to the cliffs edge, you are sure to have a workout to remember. 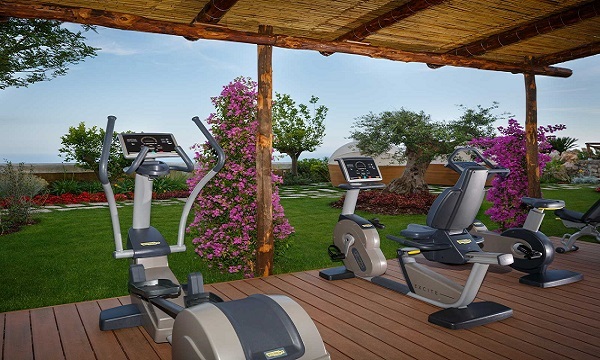 A workout during your vacation is sometimes a necessity, and if you feel the need to work up a sweat it's nice to know that some resorts have created a fitness center that is quite memorable. Check in at one of these Best Hotels that offers guests a gym with a view. If you have to workout during your stay, you might as well enjoy the beauty beyond the walls.